The CBK-55BK build-up kit enables one-person operation of the PMW-F55 and PMW–F5 CineAlta cameras, making it easy to achieve a shooting style to suit a variety of needs while maintaining the familiar, easy-to-use interface features of traditional shoulder camcorders. Ergonomic design usable with any lenses and featuring an adjustable shoulder pad and front block control. Provides a slot-in option for the DWX Series DWR-S02D 2 channel digital wireless receiver. Shoulder pad has 33m adjustable range. Front block with all control buttons has 37mm adjustable range. The build-up kit also supports the AXS-R5 for 2K/4K 16bit RAW recording up to 240 fps in 2K. Battery adaptor includes DC input, Hirose 1.8A DC output and D-TAP 4.17A (50W) DC output*. * D-TAP DC output not available when using AXS-R5. 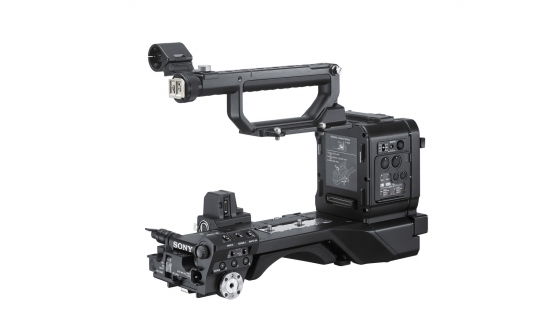 The build-up kit features an easy to attach/detach mechanism that allows you to use the PMW-F55/F5 as a full shoulder camera or in the original style, giving you more flexibility in your style of shooting. The build-up kit includes an audio section and input/output section at the rear side, offering support for wireless audio, with a familiar design common to main broadcast camcorders. Using standard PL lenses or common B4 2/3-inch broadcast lenses with the LA-FZB1 or LA-FZB2* will suit a wide variety of applications. * When using the LA-FZB2, the original handle supplied with the camera needs to be used. The new improved top handle comes with a microphone holder and viewfinder cable protection. It also provides cover for the fan input on the top of the body to protect against rain or dust. The handle is also able to attach the CBK-WA100 wireless adaptor without needing a USB connection. The build-up kit includes an audio slot-in option and input/output section at the rear side, offering support for DWX wireless audio receiver, with a familiar design for main broadcast camcorders. This slot-in receiver works seamlessly with a number of DWX series transmitters to create a fully digital audio workflow.